Have you ever played a game for just a few seconds and instantly known how the rest of the experience was going to go? I had that moment when I began playing Morphite and immediately noticed that the aiming sensitivity was off. The game does allow you to adjust it in the options, but as someone who almost never needs to touch the default settings in console shooters, this inability to get something as basic as control right just sets the tone for everything else. In Morphite you play as Myrah, an ambitious go-getter eager to explore the galaxy with her lil’ buddy Kitcat, a sassy mechanical feline who speaks in a monotone voice and serves as your guide while traversing the great unknown. While doing some scavenging for your boss Mr. Mason, you find a mysterious old temple with some strangely familiar markings, and the story unfolds from there. The high-quality voice acting brings a lot of personality to the adventure, but the focus on cutscenes is perhaps ill-advised when the characters move like robots and often lack faces entirely. 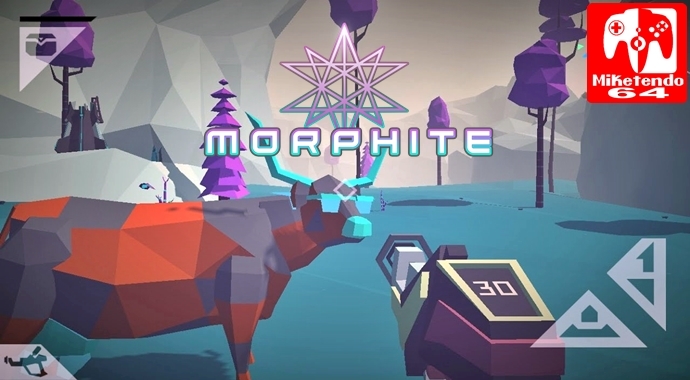 Despite immediate similarities to PS4 and PC exclusive No Man’s Sky, Morphite‘s gameplay is incredibly basic in comparison. Visiting a planet to complete a story mission consists of stumbling around looking for the next objective while doing some extremely light platforming and shooting power sources to activate nearby mechanisms. You can also visit planets that aren’t story related (though your reward for going off the beaten path is usually just a barren wasteland with a few resources scattered about) as well as complete subquests like collecting berries to make a pie or putting roasted marshmallows in the mouths of some eskimo crocodiles (???) to obtain rewards used to upgrade your gear and weapons. Speaking of which, despite much of the game involving shooting angry animals and enemies with various forms of futuristic weaponry, your starting pistol is so incredibly inaccurate that the game ends up feeling like a Stormtrooper simulator. Even once upgraded to shoot properly, the combat never evolves beyond simply backing away from foes while firing. You’re also given a scanner that allows you to collect data on plants and animals on the various worlds you explore that you can later sell for chunks (the game’s currency), but trying to scan anything more active than a rock is a crapshoot as your aiming reticle must stay directly pointed at the object being scanned during the entire process, and there’s no lock-on. Again, this issue can be solved by hunting for minerals and chunks to upgrade your scanning range and speed, but it’s annoying that your inventory items need to be enhanced just to feel like they’re functional at a basic level. When not exploring temples and gunning down innocent wildlife, your time will be spent in your ship’s cockpit. Don’t get too excited – aside from a few quick segments where you dodge asteroids while traveling to a planet, your spacecraft really just amounts to a fancy menu screen. You’d think that the developers wouldn’t be able to add weird quirks to a simple menu, but boy would you be wrong. The world of Morphite is represented on a star map, and to hop from planet to planet you’ll need to make sure you have enough gas. Once at a gas station, you can pay chunks to fill ‘er up, and – wait, I could have sworn it would cost me 25 chunks for gas, but after checking my phone for a minute I looked back up to the screen to find that the cost was now just 22 chunks, and the price continued to drop! I thought it was a glitch at first, but apparently your ship just slowly recharges gas for free if you sit at the station. Why is this gas mechanic in the game if it can be skipped completely? Who knows! You can also physically enter the gas station to chat up NPCs for items to buy if you feel so inclined, though why these encounters needed to take place in a 3D space rather than simply being another selection on the gas station’s menu screen is beyond me. It goes without saying that the game’s low-poly graphics are quite stunning, and the soundtrack is comprised of some very smooth electronic tunes, but despite the stellar presentation it’s hard to recommend Morphite‘s blend of substandard FPS gameplay and unnecessarily eccentric design decisions. If you have a lot of patience you might squeeze some fun out of this sci-fi tale, but the rest of us are better off waiting for Metroid Prime 4 to satisfy our need for intergalactic shooting and scanning. Morphite is too involved to be a walking simulator, but not engaging enough to be much of a shooter. If you can get past the glacial pace, janky platforming, and weak combat, perhaps you’ll find something to enjoy here.